There are about 7 pieces of furniture ( kitchen, several nooks, bathrooms) made of some nice wood. It looks like cherry but I am not completely sure. One piece – the kitchen is about 12 feet long, the rest are about half of that. Unfortunately whoever finished it apparently did not have an idea what he was doing. Some guy who was in the house and claims to be a handyman, says that probably they spraypainted it from a can because it is very uneven with spirals going vertically. Moreover the finish started falling off in places. I guess it is tinted lacquer as it dissolves in acetone and leaves unstained wood below. In places it flakes off it leaves clean wood, so looks like the wood was not stained. The complication is that doors have mitered figured stiles and rails. Some doors have raised panels some plywood. 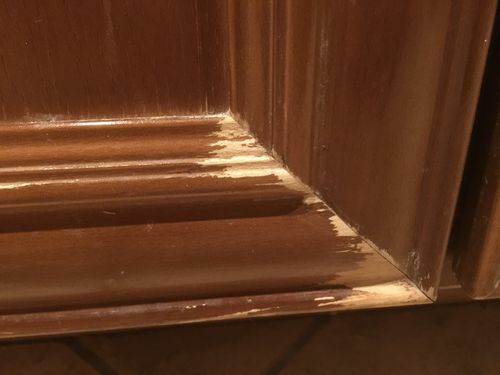 Any idea how much time would it take to strip the finish and get it ready for refinishing. How to remove the lacquer from the figured pieces ? This is the exact door I am talking about. Just buy a gallon of lacquer thinner, get yourself some rubber gloves and a roll of paper towels and start wiping. Lacquer comes of readily, if that is really what it is, even if it is many years old. You can also use paint and varnish remover but it isn’t necessary for just lacquer. 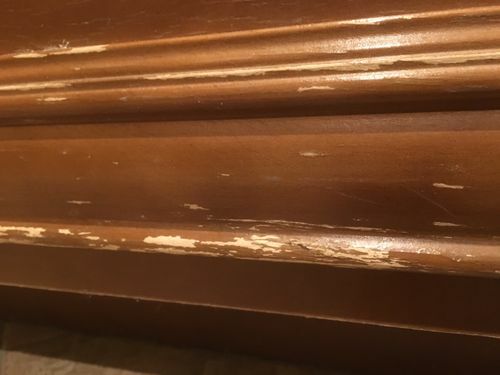 I will warn you that some kind of contaminant on the wood – like silicone furniture polish or car wax – might be the reason the lacquer is falling off. The contaminant will have to be removed also. I use rattle can lacquer often when the project is too small to warrant getting out the HVLP sprayer. I have never had any problems spraying from a can like that. It just takes a little skill and practice. I would say the handyman isn’t very handy when it comes to wood finishes. The wood in that picture looks like natural cherry which has been allowed to darken in the sunlight. All heart cherry eventually has this color. I would never stain cherry unless I was trying to make it look like some other wood. My closest experience with what you are doing is with red oak cabinets that had been sprayed with lacquer. The finish had gotten gummy from decades of use. I first cleaned the surfaces with Formby’s Furniture Cleaner, which won’t do anything to the lacquer but will cut away grease and grunge. Then, I used lacquer thinner and a new paint brush to reflow the existing lacquer. In a few places, I applied fresh lacquer over what was already there. The whole thing turned out good but not excellent. The lacquer flakes out at the bottom of the cabinets, close to the floor Not sure why. I will try “reflowing” the lacquer what do I have to loose. you might want to look into pressure blasting the doors.with the right media, it removes the finish without damaging the wood. So, how is the refurbishment going?